Even though more men are choosing greater involvement with their families, miles of improvement are still needed to shrink the gap between the average mom and typical dad. Much is said about what the guys lack and should do to make things better. But what can the women involved do to help a father tap his potential? If seeing more men at the park in the middle of a weekday or carrying a macho-looking diaper bag isn’t enough, statistics might help women see that today’s family man is different than that of generations past. A recent National Center for Fathering-Gallup Poll found that more than 90% of fathers are present at their kid’s births. A Pew Research survey published in 2013 found that, “When asked about their preferences between staying at home raising children and working for pay, a nearly equal share of working mothers (52%) and fathers (48%) say they wish they could be at home.” Going further, there are more men taking the primary child care duties, whether it’s because their wives are working more or because they are single dads. Part of the reason for this is that many men want to be around more than their fathers might have been. The drive to improve things for their own kids makes them drive more carpool, get home on time for dinner, and take real vacation time that focuses on the kids. Women can play up the trends and intentions by planning more social time with families that have involved dads. 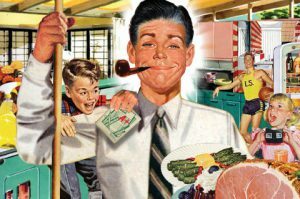 Men respond well to competition and hanging out with families that feature other guys who are breaking the old father stereotypes might encourage them to do the same. Despite the changes in how men view childcare commitment, they are still subject to the old expectations of being the primary breadwinner. Many guys feel inadequate if they don’t make as much money as their working women. And the media still reflects a general dominance of male CEOs, mainstream workers, and politicians. Women can address these issues by removing the competitive factor that has arisen between spouses. Explain to your partner that you don’t care who makes more money in the house since it all ends up helping the family. More importantly, emphasize that what you and your husband are doing is modeling for your children. 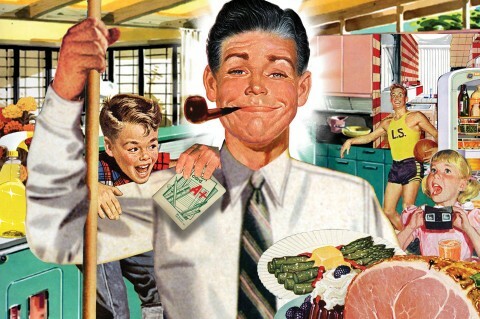 Your husband can be a leader in his own home by showing his kids that he doesn’t care about who makes the most money. What matters is the effort put into it. Then there’s the issue of the “other #1” – being a #1 father. Momentum is huge in just about any long-term endeavor. That’s why the sooner a father gets involved in being a parent, the better the chance he will stay in the groove over the decades. Just as conception is always a two-person job (even with modern fertility methods), be sure to keep everything else related to the child a partnership. Read pregnancy books together, go shopping for nursery items together, and go to birthing class and the hospital (!) together. After birth, maintain the rhythm by having dad change diapers, read to baby, and feed baby bottles (breastfeeding moms can still have father give a bottle each day or a couple a week). Yes, a woman carries a growing baby in her womb, gives birth, and often breastfeeds the child. That doesn’t mean a man lacks the desire to nurture. Some men have a hard time finding that nurturing impulse, which is why the momentum factor is important to start before the birth. On the flip side, there are guys who want to be VERY involved, but have spouses who keep all the fun to themselves. Lots of evidence points to baby’s needing more of Mommy than Daddy, especially early on, yet mounting statistics prove the significance of fatherly involvement in developing children. Studies show that children with fathers who care for them, especially from infancy, end up more secure in life, among other benefits. Still, a lot of women think they know how to care for children best. They tell dads how to do everything, down to the smallest detail. If the fathers do something differently from the moms, they are reprimanded and often taken off some parenting duties. This is detrimental to the father, who needs confidence in his abilities, and the child, who just needs Daddy to round out her life experience. The key here is to understand that different is not wrong. If a father feeds the kids something other than what a mother suggests, it can still be OK (as long as the food’s relatively nutritious). If Dad takes the children to the movies instead of reading books, that can be all right, too, because it’s still parenting time. It’s also important to recognize that fathers parent differently. Dads let kids roughhouse more and take more chances. This is different than moms but good for children’s developing understanding of the world and their limits. One terrific way for a mom to let go a little more is to have a dad take one night or one weekend day alone with the kids. Mom can go out with friends, out of town, whatever, as long as dad must fend for himself. It’s tough for most dads (heck, it’s hard for moms too), but this will allow a man to figure out his own pattern with the kids and not rely on the crutch of a mother. Certainly, keep the cell phone line open for questions, but resist the urge to check in or else risk insulting a father’s capability. We all need praise for what we do. It’s not that fathers need more of it – actually, they do. The fact is that, while stereotypes are changing, Mom is still the go-to parent in most families. The only way to ensure the shrinkage of the gap between mother and father involvement is for the dad to feel in control, confident, and satisfied. Tell your partner what he does well more than criticize him for where he falls flat. You can offer advice, but do it as a team, saying, “This is what we both need to work on.” The more a father gets in the regular rhythm of child care, the more natural it will be for the man to make good on his potential. © 2017 Gregory Keer. All rights reserved.